After the delights of enormous string libraries, providing broad brush stroke approaches to writing, which have characterised recent film, gaming and TV music to some extent, Spitfire are at last proud to present a new set of brushes. The finest of sable brushes if you will, to provide you with the tools you need to write detailed and focussed string parts that have a personality and style that represents your personality, that expresses your creative will and provides you with fresh pastures of experimentation. Hot on the heels of its much-admired Albion orchestral collections comes Spitfire Audio's Sable String Vol.1 - a set of string sounds designed to aid the writing and production of more focussed violin and cello parts. Music makers want many different things from string libraries. Pop producers tend to crave broad, sweeping articulations to lend greater authenticity to their pad-like writing while film and TV composers need a vibrant palette of string 'colours' when scoring to picture. 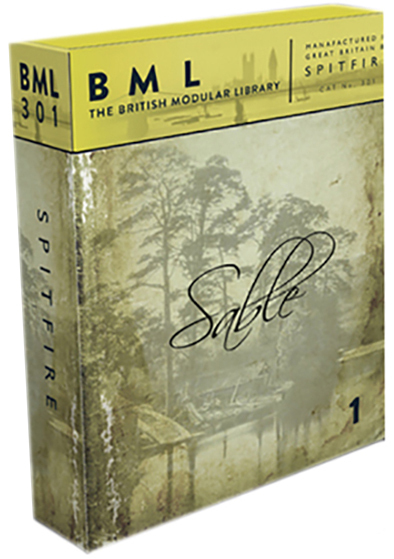 In recent years, British orchestral library developer Spitfire Audio has steadily amassed a set of orchestral collections appealing to both camps; its Albion libraries has provided a striking balance between a great sound and a set of rather easy to use articulations. Considering these their 'broad brush strokes', Spitfire have returned with what will soon become a new series of titles called the British Modular Library. These will provide finely detailed and focused sounds, with the first out of the starting block being the appropriately titled Sable Strings Vol.1. Part of a new, long-term project entitled THE BRITISH MODULAR LIBRARY providing composers with the ability to add fine detail, musical expression, beauty and focus to their work. To write music that musicians love to play and to get the most out of smaller ensembles and the wealth of timbral colour and character they can add to any project. After many years of development experience Spitfire will present this library with a user interface and set of features unprecedented in any library to date. With 7 mic positions, recorded at 96k through vintage valve and ribbon mics to tape through Neve premaps and Prism convertors, and presented at 48k, 24bit in Kontakt format, and additionally three extremely useful ?mixed? versions presented in Stereo and 5.1 Surround. "The Sable Strings mission is to provide a detailed, almost concentrated string sound"
The Sable band is 4 x 1st Violins, 3 x 2nd Violins (totally different players seated in their correct positions), 3 x Violas, 3 x Cellos and 3 x Contrabasses. "essential articulations" for the 1st violins and cellos. A deep and detailed articulation list that will provide you with everything you need to create the most amazing string parts. We feel that this module is a game-changer, the first time such a powerful tool can operate within your palette that doesn't behave like a steam train of strings ploughing through your compositions obliterating everything in it's path. With an Albion as a base unit, these sable brushes bring everything into sharp focus. But as a complete set, these will be a thing to behold. We hope sampled section strings will never sound the same again and usher in a new era of sophisticated and diverse string writing. Downloadable in 4 packs: 1. (Close, Tree, Ambient, Outrigger Mics) 20 GB, 2. (Stereo Mixes) 8 GB, 3. (Gallery, Close Ribbon, Stereo Mics) 14 GB, (5.1 Mixes) 4. 18 GB = 60GB of lossless NCW compressed data. (PACK 1 & 2 AVAILABLE TO DL ON THE 11th FEB, PACKS 3&4 AVAILABLE AFTER INITIAL RUSH).